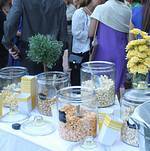 Popcorn bars are a fun way to add flavor, color, festivity, and fun displays to catered events! They're delicious, semi-nutritious, and fabulicious :) While they go well on their own, popcorn bars can be combined with thematic centerpieces to really set the atmosphere - you can just imagine the fresh smell of popcorn at the carnival (kettle corn, yum! ), at the ball park (get your fresh peanuts), at the movies (in the big tub with real butter), or in a more rustic setting with jars and scoops to show off colors, flavors, and seasonings! We love mixing it up with different flavors and toppings and have made our popcorn bar menu accordingly. We also love theming it to the decor of your event, so let us know what atmosphere you're setting and we can pull from a wide range of jars, cones, shakers, signs, baskets, etc to help you set the atmosphere for a thematic event with service. 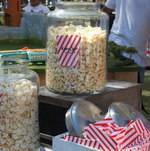 Popcorn Bar MenuChoose from plain or caramel popcorn and a wide variety of popcorn toppings!